competition is getting dirt day-by-day. Along with this, agency businesses in India are at a saturation point- from here to where? Just because there is so much uncertainty in the ecosystem, the way things are delivered and also the expectations. Many businesses start an agency with one or two clients in hand but later get stuck when they are not in a position to win any more new clients. Winning a client is one of the biggest challenges you would face when there is a lot of competition; especially in the markets like Mumbai, Bangalore and Delhi. Client retention is yet another problem in the marketing industry. Clients are not educated enough and on one side they are okay to spend thousands of rupees in traditional campaigns and on the contrary, they don’t see great value in Digital. • Ask for Hike and Face the Consequences: When a small agency asks for a hike in their monthly retainer, clients usually threaten them with an exit statement to find an alternative agency. Yet, the agency owners don’t say goodbye to these clients as they fear this would impact their cash flow and profit margin and somehow, they try to satisfy themselves by saying that it’s one of their oldest clients and so they would like to keep the relationship maintained. Many agencies get washed-up because they are not able to cope with the rapidly changing digital landscape. The changing landscape of digital demands for strategy first and creativity next but Advertising Agencies that got turned into digital agencies put creativity first, failing to work towards a strategic strategy. The digital landscape may change overnight and client-population in India need to be educated about it; for example, half of them don’t even understand the value of advertisements on social media or other digital platforms. Such clients would give you a fixed retainer and wait for magic to happen. Clients at times take agencies for granted. Some clients have unrealistic requests in the name of a favor- for Banners, Wedding and Birthday Invitation Cards, Daughter’s naming ceremony card etc. Many agencies may do this only to satisfy their client or to make them stay. But eventually must resolve to refuse or put a fee for this favor and you will realize that they would never ask you again for a favor. The biggest mistake agencies do is that they don’t sign a prior contract with the client before they start offering their services to them and often, they don’t even ask for payments from client on time.An ideal agency should raise the bills on time, demand payments on time and also stop offering their services if the payments are not made. Client payment is the fuel for the agency’s survival, so don’t compromise on this. Learn about payment history of clients from others who they have worked it earlier. This is again one of the biggest challenges. For example, for Facebook Advertisements, we generally convince clients to use their cards, as there is a lot more transparency. By raising bills from your side, you will have to pay reverse service tax and charge client service tax upon billing and so, a client always think that the budget is not rightly optimized and asks for proof just to stay assured that the money has gone in the right hands. As an agency we insist clients to only use their cards and route their account under our agency account. Or take an advance payment from client for advertisements; as this is something that you can’t chase them for later. Most of the agencies in India are occupied with millennials and working with a millennial mindset is a challenge in itself. Attrition is one of the key challenges that agencies are facing and so is the concept of floating employees. As soon as the digital crowd starts becoming 30+, then there shall be a lot more stillness in the floating populace. Most of the agencies usually get stuck here as they don’t know how to scale their business. They may sort out to open new offices in new locations is a new name. But every time you think of scaling up an agency, you might see your crucial employee leaving or you might see your existing client unhappy. There is a thin line between your current state and your state of imagination. One can start by signing contracts with your existing clients and take them in confidence to sign a contract to stay with you for at least 2 years. So, you first need to secure what you have and then this security will help you convince your future investors. Digital Marketing is an accidental profession for many. 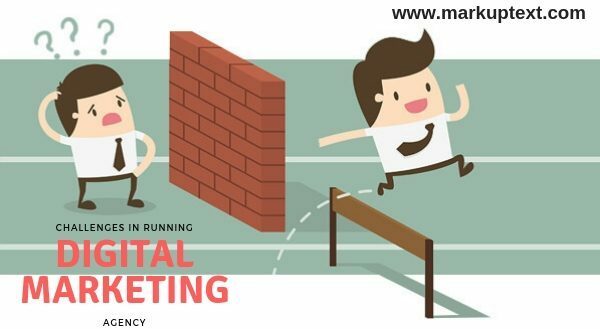 Talent is the biggest problem in the digital marketing industry as most of them are freshers and you will have to mold them into becoming a good digital marketer only with experience. Whereas, the experienced ones generally don’t like to hang out within agencies as they find their solace only on the client side. The market is so competitive that one might just miss out on something really big by the time he books his flight tickets or your client might just be very eager to get something done quick. There may come times when you can’t refuse a task and end up pulling an all-nighter. This sure draws a lot out of you and you definitely have to find your own ways to strike a balance between your personal and professional life. Your employees have to work in complete co-ordination with one another for maximum productivity. And, you wouldn’t be able to make them work as a team unless you keep them happy. As long as you give your employees relevant incentives and maintain a healthy working atmosphere, you don’t have to worry about constantly being after them to get the job done.